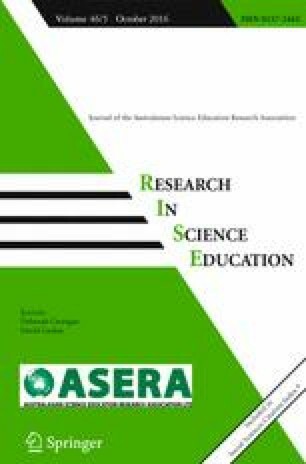 Integration of technology, social learning and scientific models offers pedagogical opportunities for science education. A particularly interesting area is thermal science, where students often struggle with abstract concepts, such as heat. In taking on this conceptual obstacle, we explore how hand-held infrared (IR) visualization technology can strengthen students’ understanding of thermal phenomena. Grounded in the Swedish physics curriculum and part of a broader research programme on educational uses of IR cameras, we have developed laboratory exercises around a thermal storyline, in conjunction with the teaching of a heat-flow model. We report a narrative analysis of how a group of five fourth-graders, facilitated by a researcher, predicts, observes and explains (POE) how the temperatures change when they pour hot water into a ceramic coffee mug and a thin plastic cup. Four chronological episodes are described and analysed as group interaction unfolded. Results revealed that the students engaged cognitively and emotionally with the POE task and, in particular, held a sustained focus on making observations and offering explanations for the scenarios. A compelling finding was the group’s spontaneous generation of multiple “what-ifs” in relation to thermal phenomena, such as blowing on the water surface, or submerging a pencil into the hot water. This was followed by immediate interrogation with the IR camera, a learning event we label instant inquiry. The students’ expressions largely reflected adoption of the heat-flow model. In conclusion, IR cameras could serve as an access point for even very young students to develop complex thermal concepts. We are grateful to Charles Xie for sharing ideas of how IR cameras may enable school science inquiry. We also kindly thank all involved students and the teachers who developed the overall storyline and collaborated during design and implementation of the IR camera labs. The ethical requirements stipulated by the Swedish authorities for conducting educational research in schools were strictly adhered to. Informed consent to participate in the study was gathered from the students’ parents, and pseudonyms of the participants are used throughout the text to guarantee anonymity. Xie, C. (2014). The Concord Consortium. Infrared tube. http://energy.concord.org/ir. Accessed 16 May 2014.